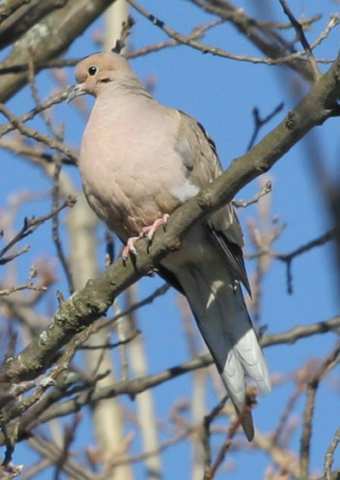 A mourning dove is perched on a branch overlooking a field at the Bowman Street Conservation Area in February. Mourning doves are one of the most common birds in the country. We're not yet waking up to a chorus of birdsong at dawn, but the coo of the mourning dove is a clue that spring may yet come to Westborough. Starting in February or March, we're quite likely to hear and see morning doves (Zenaida macroura). That's when the breeding season begins, and the male bird coos as part of his effort to stake out a territory and attract a mate. Most of the cooing that you hear is likely to come from the male, although the female may answer with fainter coo. Like other songbirds, male mourning doves begin to sing--to coo--in the spring as the levels of their male hormone--testosterone--rise. In the fall, when our surroundings go silent, the reason is not only that many birds have left for warmer parts. It's also that the year-round residents have stopped singing with the close of the breeding season and the lowering of their hormone levels. Mourning doves are a common sight, even in the backyard, as they perch and coo from wires or bare tree branches. You're also likely to see them on the ground, feeding on seeds and acorns. They're attracted to bird feeders and the seeds that spill from them. Sunflower seeds and millet are among their favorites. Mourning doves are named for their coo, which has a sad and mournful sound to many people. They are also sometimes called turtle doves or Carolina doves. Some of the mourning doves in our area may stay throughout the winter. The younger birds, hatched in the past year, are most likely to migrate south and then to return in the spring. Other mourning doves that you see may be passing through. Mourning doves pair up with a single, exclusive mate for the breeding season, as 90 percent of birds do. In our area, a pair may raise three broods throughout the spring and summer. In the case of mourning doves, the male and female work together in building a nest, keeping their eggs warm, and feeding and taking care of the young. The pair builds a flimsy, saucer-shaped nest in a pine tree, shrub, or large vine. Occasionally mourning doves nest on the ground or use another bird's old nest. The male gathers sticks, pine needles, grass, and other materials. The male typically stands on the female's back and passes nesting material to her, and the female constructs the nest. Mourning doves usually lay two white eggs. Both parents sit on the nest, keeping the eggs warm until they hatch, about two weeks later. The male stays on the nest for a large part of the day, and the female sits on the nest during the rest of the day and at night. Once the young hatch, both parents feed them a nourishing fluid called crop milk or pigeon milk. It is rich in fat and protein--good for the nestlings' growth. It is produced in the parents' crop, a sac-like portion of each dove's gullet. After the first few days, the crop milk includes increasing amounts of partially digested seeds. The young birds grow up quickly. They open their eyes after a week and develop feathers within 10 days. At about two weeks of age they leave the nest, but the parents--particularly the male--continue to feed them for a while. As with many birds, a large proportion of young and inexperienced birds don't survive their first year. Mourning doves are one of the most common and widespread birds in the U.S. They are native to the continental U.S., Alaska, Canada, and the Caribbean. They are very adaptable and co-exist well with humans. They do well in the open spaces that farmlands, suburbs, roadways, and other development have created in formerly wooded landscapes. Like deer, mourning doves thrive in "edge" environments, where woods meet fields, lawns, parks, and other open areas. Also like deer, their numbers have increased along with human settlement and development in places like Massachusetts. As ground feeders, mourning birds are vulnerable to hawks, owls, foxes, and our very own housecats. In one survey involving mourning doves that had been banded, cats had killed more than 20 percent of the dead mourning doves that had been found and reported. Mourning doves are strong and agile flyers. This ability helps them to evade predators and to make long migration flights. Their wings often make a whistling sound when they take off from the ground or a perch. Mourning doves have been protected in Massachusetts since 1908, but elsewhere they are popular with hunters as game birds. Approximately 40 states allow hunting of mourning doves. In lore and symbolism, mourning doves share the association that doves in general have with peace and love.